New York, USA -- Middle-school art teacher Sharon Fleisher wanted to master the art of handling difficult students without losing her cool in the classroom. The Huntington resident's headaches and stiff neck made her mission critical. "I really needed a way to handle my frustration because I didn't want to take it out on the kids," she said. A friend suggested she visit the Dipamkara Meditation Center in Huntington. Fleisher took the advice to heart, and, more than three years later, she is not only a student but the center's administrative director. Meditation "totally transformed my experience in the classroom, and it transformed my relationship with people," said Fleisher, 48. "I am much more patient and accepting. I am much more willing to put myself in the other person's shoes." Many Long Island residents, particularly those over 40, have turned to meditation to battle stress or other health problems. Some hope for a deeper spirituality or simply want to satisfy their curiosity about a practice that is still mystifying to many Western minds. It isn't known how many groups Long Island has because no one tracks their numbers. However, anecdotal evidence indicates growing interest. For example, the Sunday meditation session at St. Ignatius, which debuted with two people less than 10 years ago, often include up to two dozen practitioners. The Dipamkara Meditation Center, with a core membership of 148, has grown so much in the past few years that the group plans to move into a new, permanent space in the village that will eventually more than double the center's space to 6,000 square feet, Fleisher said. National numbers on meditation also are hard to come by. But in 2002, more than 30 percent of U.S. adults used alternative medicine techniques that included meditation, imagery, biofeedback and hypnosis, according to the National Center for Complementary and Alternative Medicines in Bethesda, Md. And a growing body of scientific research showing meditation's intellectual benefits has most likely boosted interest in the practice. A Massachusetts General Hospital study published in November showed that meditation slowed the aging of certain portions of the brain and increased adherents' ability to focus. The meditators who participated in the study practiced Buddhist insight meditation, which focuses on breath and internal experiences. "Our results suggest that meditation can produce experience-based structural alterations in the brain," said one of the researchers, Sara Lazar. "We also found evidence that meditation may slow down the aging-related atrophy of certain areas of the brain." Lazar, who meditates, had long wanted to train a researcher's eye on the practice, she said in a telephone interview. "I had experienced effects I was curious about," said Lazar, who is also a Harvard Medical School psychology instructor. "Were they real or just in my mind?" Her research provided some answers, she said. The body of research on the influence of "mind-body therapies," which include meditation, also suggests, among other things, that the practice of those disciplines may improve recovery from surgery and reduce pain from it, according to the complementary-alternative medicines association. The Dalai Lama, a Buddhist monk and Tibet's spiritual leader, has frequently urged scientists to study meditation's effects on the brain. And he repeated that call at a Washington brain-research conference in November. "By gaining deeper insight into the human pysche, we might find ways of transforming our thoughts, emotions and their underlying properties so that a more wholesome and fulfilling way can be found," he told the conference. Sea Cliff resident Neil Smith, 55, a freelance television cameraman, joined the Inisfada Interfaith Zen Center at the St. Ignatius Retreat House in Manhasset to take aim at on-the-job stress. On a recent Sunday morning Smith was one of nearly two dozen people who gathered to meditate. 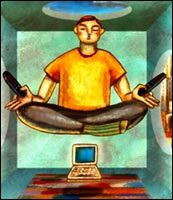 Some meditators sat cross-legged on big square navy-blue cushions, like Smith, or on special kneeling benches atop the cushion, or in chairs along the wall. The group had its customary two sittings of 25 minutes interspersed with two 10-minute walking mediations on the grounds of the stone mansion, which was built in 1920 for millionaire Nicholas Brady and later donated by his widow to the Jesuit order. "In times of great stress and chaos [brought on by the job], I can be calm," Smith said. "There are times when I am stopped dead in my tracks by the sight of a tree in my yard that I have barely glanced at in a quarter century," added Smith, who grew up in England and was raised in the Anglican church. The form meditation takes is as varied as the reasons for exploring it. The St. Ignatius group sits in silence and practices insight meditation. Transcendental meditators intone a mantra that consists of a word or phrase. Some groups focus on positive thoughts they hope their lives will embody. Other groups use yoga as the gateway to a quiet mind before meditation. And the groups are usually interfaith. "That is why it's an appropriate method to bring together people of many faiths or no faith," said Father Robert E. Kennedy, a Jesuit priest and the Zen teacher at St. Ignatius. "We just sit and breathe together and not shout our certainties at one another." Anne McNeill, 63, who lives in Williston Park, has been meditating at St. Ignatius for five years and attends three meditation sessions a week. A search for a deeper spirituality and sense of self led her to meditation. "I do feel that I am more relaxed," said McNeill, who is Catholic. "When I go to Mass I can be much more present in Mass than before." Islandia resident Grace Welch has practiced yoga and meditation for 30 years. She decided to give them a try because of her stressful job as an assistant to a president of a Wall Street trading firm, as well as back pain so severe that she had to sprawl on the floor for relief. One day her daughter, who was then studying yoga as part of a Carnegie Mellon University drama program, saw Welch lying face-up in agony, and said, "You should do yoga." Yoga and meditation proved to be the perfect prescription, Welch said. "I don't have many back pains now," said Welch, 81. And she makes a rare claim for an octogenarian: "I don't take any medications at all for anything." Paula Fullar, who has meditated off and on since the '70s, has so embraced the practice in the past few years that she belongs to three groups. The 56-year-old Freeport resident was inspired to experiment after a mentor, left paraplegic by a motorcycle accident, began to meditate to come to terms with his limited mobility. Despite its unusual formula for inducing relaxation, meditation is simple, practitioners say. "Just by doing a simple breathing meditation, you begin to learn how to settle your mind," said Fleisher, the art teacher. "It didn't take much," she said of her initial experiences. Not everyone looks kindly upon meditation, though. Fullar said her uncle, a Lutheran minister, told Fullar's mother that meditation was "the work of the devil." Fullar's mother countered that meditation allowed her to feel a deep spiritual peace she had never sensed before. "I agree with her," Fullar said. Schools of thought: types of meditation Insight meditation: Practitioners who follow this type of meditation sit quietly, observe their breath and "bear witness" to internal experiences. This school includes Zen Buddhist meditation and Vipassana, one of India's most ancient meditation techniques. Concentration meditation: Meditators focus on their breath, an object, or intone a mantra, usually for at least 25 minutes. The goal is to empty the mind and sharpen one's focus. This category includes Zen meditation and transcendental meditation. Meditation in motion: This includes yoga, tai-chi and walking meditations. The objective is to focus on motion in order to strengthen the concentration and awareness of the meditator's mind. Some meditation centers on Long Island and Queens. Call for expanded times and prices. Chakrasambara Buddhist Center in New York (Astoria branch): Grace Lutheran Church, 31-20 21st Ave. (at 32nd Street; noon to 2 p.m. Sundays. 212-924-6706. Dipamkara Meditation Center: 274A, New York Ave., Huntington, with branches in Smithtown, St. James, Manhasset, East Northport and Bellmore. Bay Shore and Babylon branches opening this month, a variety of programs and workshops. 631-692-9594. Freeport Zen Group. South Nassau Unitarian Universalist Church, 228 S. Ocean Ave., 10 a.m. Fridays and 7:30 p.m. Mondays. 516-623-1204. Hauppauge School District Adult Education. Yoga and meditation. Tuesdays, 6 p.m. beginners; 7:30 p.m. intermediate. 631-380-0800. Sophia Zendo at Tabor Retreat Center, St. Anthony's Roman Catholic Church, 60 Anchor Ave., Oceanside, 7:30 p.m. Wednesdays. 516-678-6614. Yoga Anand Ashram, 42 Merrick Rd., Amityville, 631-691-8475; 9:30 a.m. Sundays, 7:30 p.m. Wednesdays.